The Democratic Congressional Campaign Committee, or more commonly referred to as the D-triple-C , is dedicated to electing Democrats to the US House of Representatives. The end of 2017 saw a once-in-a-generation moment for our nation —and for the Democratic Party. While the shadow of the Trump presidency hovers ominously over the American people, the energy of the progressive community, and all those standing up to resist, has been nothing short of electric. The Democratic Congressional Campaign Committee is well positioned to harness that power, to engage a new generation of Americans and reignite the passion of older generations, and to lead the fight to defend our Democracy. 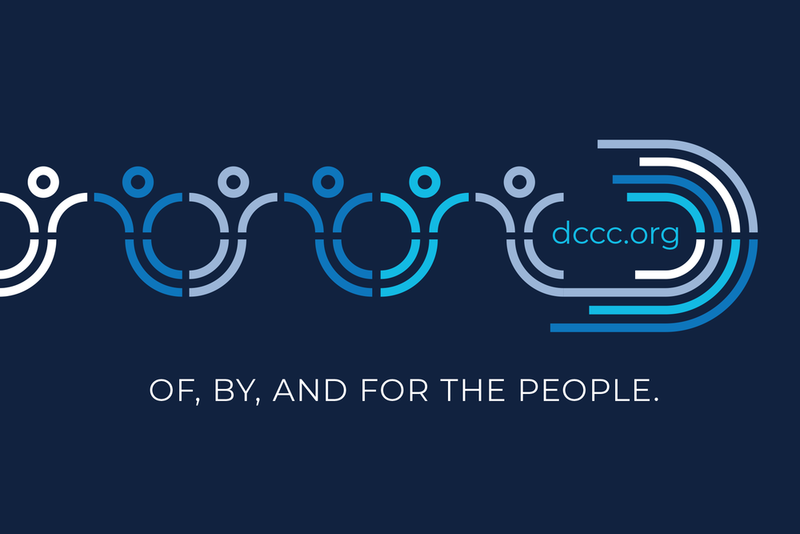 To achieve maximum success in that effort, the DCCC sought to create a modern, thought-through, cohesive identity—a banner behind which supporters can rally. There was a need to go from competing style guides, a confusing array of color palettes and typefaces, and an outdated logo to something more modern, strategic, professional, and focused on partnership. Based in D.C., creative director Lucas Fleischer brought together the team of progressive and passionate designers up for the task. Justin Kemerling in Omaha, and myself out of Chicago—ready to craft a solution to their problem for today that will serve them well into tomorrow. A logo to embody what it means to be Democrats in the post-Obama era. Discovery began after briefing from the leadership team. A series of member interviews and surveys gave us a broad sense of the current state of affairs. Common refrains we heard were that the D-trip just isn’t about DC, it’s about the members that come here to make change. And when it comes to Democrats, we’re hopeful, inclusive, youthful, and organized. We care about moving the country forward. Concept and exploration commenced, producing five initial design packages and a back-and-forth with a few more options. Design and refinement landed the team and DCCC with an identity everyone could get behind and felt strongly towards. Our core logomark is made of thick lines in different lengths and shades of blue, forming a D that evokes the House floor. It represents our Democratic leaders who come from different places and backgrounds, with many different ideas, and unite to serve a common purpose. It’s paired with a modern, bold, condensed typeface to spell out our name, simply. The mark reflects our role in electing Democrats to the House. We partner with people on the ground, from near and far, with vastly different ideas about how to address our nation’s challenges. We bring them into harmony, onto the same path, to work together to move our country forward. This logo provides the building blocks for an expanded visual system. While the mark remains simple and iconic, the broader system can encompass all of our needs.